‘Trespass’ the album is a lovingly crafted body of work, featuring ten highly original and exciting songs from the early and hopeful days of the New Wave Of British Heavy Metal. 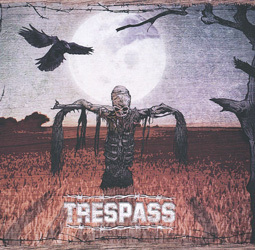 In fact, Trespass as a band were a true reflection of the ideals of the NWOBHM. They doggedly did things their own way, had sniffs of record deals that never came to fruition, and had more line-ups than ‘Police 5’, but no matter how many times the band – centred around guitarist/vocalist Mark, his brother Paul on drums and bassist and/or guitarist Dave – were knocked down they still seemed to bounce back. Even when the NWOBHM was consigned to the dustbin by the UK music press they adapted and evolved into a more radio-friendly act called Blue Blud. Three seven-inchers were all they left back in the day, and an album of later material entitled ‘Head’ followed in 1993. So, some 35 years later than planned, the self-produced and self-financed ‘Trespass’ features a clutch of re-recordings from the band’s quite plentiful back catalogue; some – both sides of the band’s first two singles, for example, and the massive ‘Metal For Muthas II’ cut ‘Stormchild’ – are quite obvious selections, whereas others are perhaps a little less well-known, like ‘Lightsmith’ and ‘Assassin’. “Both of these songs date back to the start of Trespass, especially ‘Lightsmith’ which was a live favourite back when we were still doing covers,” Mark points out. “They’re our album tracks, if you like, as opposed to ‘One Of These Days’ and the other singles. ‘Lightsmith’ is a message of peace and light overcoming darkness and conflict. I re-wrote the intro and re-arranged the main body of the song to make it more powerful and a contrast. And I also changed the lyric to ‘Assassin’ to reflect a recent experience of mine.” Elsewhere, ‘Ace Of Spades’ (from the same session that gave the band their first single) purrs along, ‘Eight Til Five’ tears into the drudgery of the day job with the fury of a chainsaw and ‘The Duel’ – the sole representative of the ‘Bright Lights EP’ – revels in the Rushness of its intro and the galloping riff which drives it along. Purists might sniff that both this track and ‘One Of these Days’ differ from their original outings, but as Mark suggested these can be viewed as the album versions rather than the original ‘single edits’. The album took little homework, by all accounts. “We didn't do much, if any, preparation for the album,” recalls Dave. “We picked the songs and re-arranged some of them more or less when we got in the studio. There are some obvious re-arrangements and some subtle changes here and there, but I remember being quite amazed at how we just played them as if we'd being playing them every day for years! Of course Paul was drumming at that point, which helped.” Paul, incidentally, has since left the band and been replaced by ex-Purson skinsman James Last.